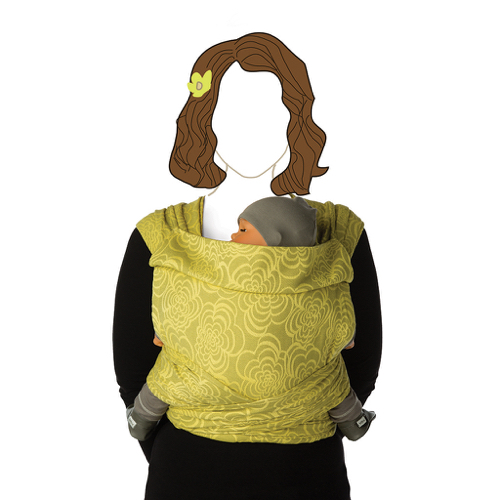 A baby-wrap is the most ergonomic way to carry your baby, whether for the parent or for the child. 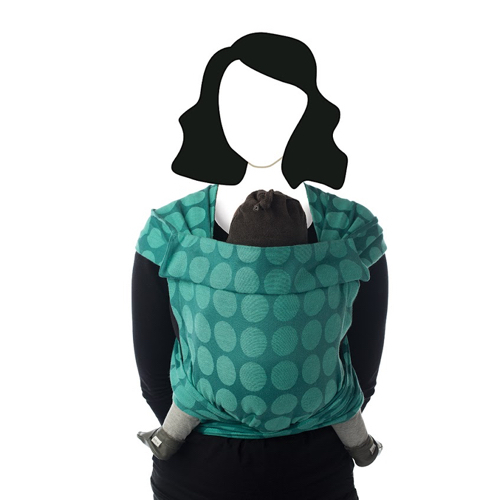 You carry your baby close in the recommended “M” position, with the knees higher than hips with a rounded back. This position gives your baby good back support, avoiding any back strain, and contributes to proper hip development. The baby’s hips are mostly made of cartilage that gradually transforms into bone in the first year. This process is enhanced when the baby is carried in the “M” position, allowing proper positioning of the bones (and articulations). The baby’s lower legs and feet should be free. When legs hang down, which is the case with some baby carriers, the back arches and it is not an ergonomic position. In a baby wrap you spread the fabric open all the way out to your baby’s knees. The baby wrap always fits, whether your baby is 2 months or 2 years old, and your baby is always in the ideal position, completely relaxed against you. The baby carrier is also ideal for you as a parent. Carrying a child in your arms is heavy. In a baby carrier, the baby’s weight is evenly distributed over the parent’s chest and hips through the wide cotton bands that cover the surface of both shoulders, so you can effortlessly carry your baby for many hours. There is little or no tension on your neck and back. A baby who is positioned correctly can be carried for as long as they and the person carrying them wish. All around the world parents carry their babies while going about their usual activities. Babies hunger for skin-to-skin contact. After 9 months of warmth, movement and constant contact with the mother, birth makes the baby undergo major changes and they need close contact with their parents. Babies who are carried close clearly benefit from direct physical contact. The baby feels safely nestled. The nurturing body-to-body contact fulfills a deep primary need of the baby and offers an ideal position to explore the world. In a baby wrap the baby feels safe and secure. They feel the body heat, hear their mother’s voice and heartbeat, recognise her scent and is in constant eye contact with her. Nestled in the baby carrier, the baby experiences the world from a safe place. Babies undergo constant stimulation in a short amount of time, and by being close to their mother, they feel safe and secure and are less fearful. This feeling of security leads to the development of a positive self-image and builds the foundations of a confident and self-assured personality. Contrary to what was previously believed, it is now clear that babywearing does not lead to indulgence and dependence, but the opposite is achieved. Research has shown that babies who are carried cry less and suffer less from cramps and reflux than those who are not carried. In a baby carrier, the baby does not passively wait for the day to go by, but participates naturally in day to day activities. The baby has so much to see and to hear, which contributes to their psychosocial development. From this safe place, the baby makes eye contact and communicates with others and the world around them. When they have had enough, they simply turn towards the parent, or close their eyes and fall asleep. In the first few months, it is not always as easy for new dads to bond with the baby as it is for the mother. For Dads, using a baby carrier helps create this bond by increasing interaction and therefore attachment. Carrying your baby makes life easier, while having a positive effect on physical, intellectual, and emotional development. With baby safely installed in the baby carrier, you will be free to go about your activities while your baby rests calmly nestled against you. Breastfeeding in a baby carrier is easy and discreet. Even if breastfeeding is difficult to begin with, the baby carrier is ideal for promoting milkflow. The closeness of your baby stimulates the production of prolactin and allows you to more easily identify the hunger signals such rooting, sucking, agitation, etc. A baby wrap takes up so little space that you can always take it with you anywhere. It is very practical whether you are walking through a busy street, taking the bus or train, or going for a walk in the woods. You avoid dirty buggy or pram wheels in your house while providing the best possible shock absorption for your baby. Babywearing positions There is currently a lot of discussion over the best way to carry your baby. In general, Babylonia discourages the face forward position, where baby is facing outwards toward the world. This is not an ergonomically correct position. More information and alternative positions for curious babies can be found here. Another position that is often questioned is the cradle position. 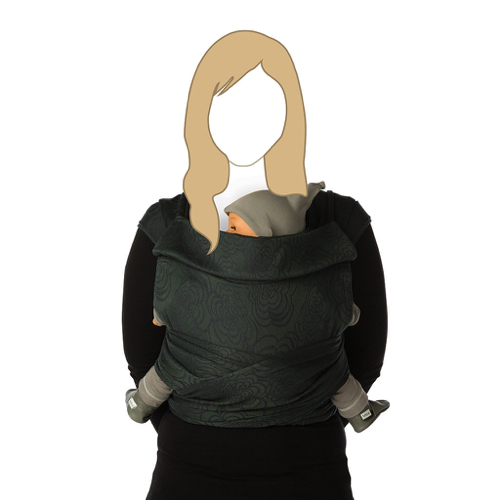 While Babylonia supports the use of the cradle position, we recommend starting in the upright position, especially if you are new to babywearing. The upright position can be used right from birth and it is the easiest way to carry your baby. The cradle position is a more advanced position and careful attention must be paid to ensure your baby’s safety. Read more about the cradle position and safety precautions here. Finally, it is often advised not to use a stretchy wrap for back carries. However, this does not apply to Babylonia's Tricot-Slen. Our special knitting technique keeps the fabric from stretching in all directions so you can carry baby comfortably on your back. Read more about back carrying with the Tricot-Slen. What should I look for when buying a baby carrier? Very simple: make sure your baby is just as comfortable as in your arms. Make sure the baby carrier gives exactly the same comfort! the fabric should be spread open all the way from knee to knee. This ensures your baby is sitting in the ergonomic M-position. baby’s back should be rounded rather than arched - this is the most natural position for a baby. easy adjustment, comfortable fit for all sizes. no clasps, buckles, or closures which might hurt. quick and easy to put on. option of carrying your baby in various positions. baby’s weight distributed evenly over the parent’s chest, back and hips. soft and preferably organic fabric. Why do parents choose a Babylonia baby wrap? In a Babylonia baby wrap your baby is just as comfortable as in your arms! 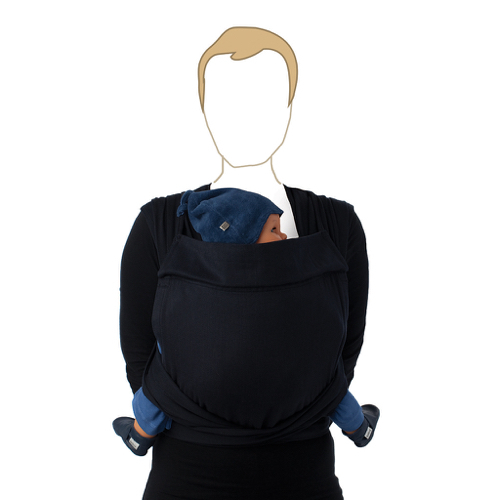 The special sling fabric supports your baby perfectly, in both cradle and upright positions. Your baby is always in the ergonomic M-position, which stimulates healthy development of the hips and ensures baby is always in the ideal position, completely relaxed against you. Your baby can choose whether to be completely wrapped up, or to have some freedom of movement. A cozy place for baby that you can use immediately after birth. No buckles, straps or clasps that might hurt. always fits, without complex adjustments. Easy to put on. no closures on your back so you can sit comfortably with your back against a chair or couch. lovely, soft, 100% organic cotton. Available in many colors and patterns to fit your style. Small and lightweight, perfect when you’re on the go! Eco-friendly; the Tricot-Slen Cool is made out of recycled plastic bottles. All our other baby wraps are made from 100% organic cotton. Babylonia slings are the highest quality. The special knitting and weaving techniques provide optimal support. All slings come with detailed and clear instruction manuals. Learning to use a sling is not difficult: more and more people find that after two or three tries, a baby wrap is very quick and easy to put on! 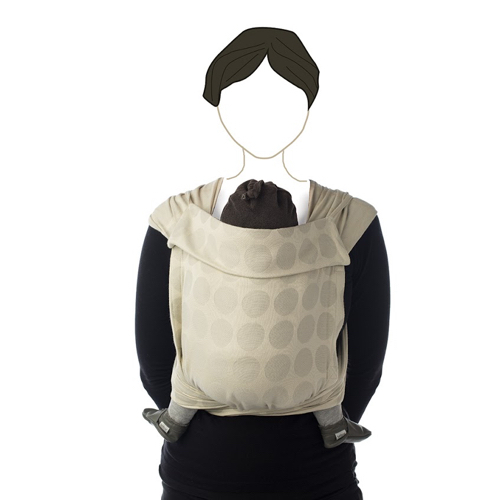 What’s the difference between a baby wrap and a structured carrier? 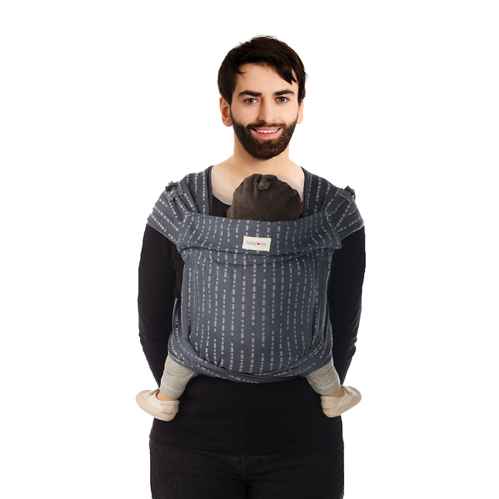 A baby wrap is a baby carrier made of unique wrap fabric that is wrapped around you and your baby. You carry your baby close to your body. A structured carrier is a baby carrier made of stiffer material that has a preformed pouch in which you carry your child. In these types of carriers, baby is not sitting cozily against you, but instead “hanging” off of your body. 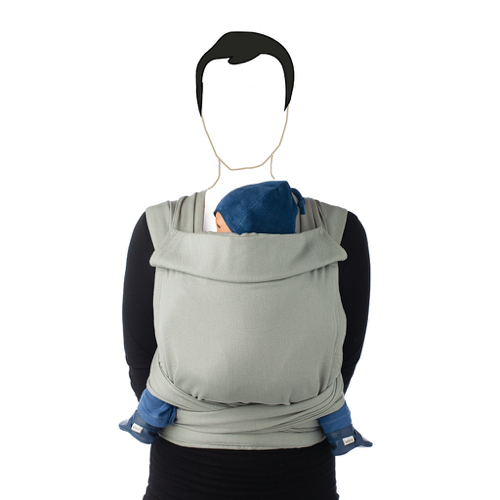 In the classic non-ergonomic structured carrier, a baby is carried with his legs through two leg openings in the "pocket " while sitting on a small support. Because the baby is not close to you but hangs on your body, he actually carries his own weight. In addition, the natural curvature of the spine in a structured carrier is lost because the baby is not supported in the right way. To contrast, in a baby wrap the baby is sitting comfortably against you. Baby is perfectly supported and the weight of your baby is distributed evenly over your own body. In an ergonomic buckle carrier, the baby is sitting on a wider support so the ergonomic M-position of the child is respected. A disadvantage of both ergonomic and non-ergonomic structured carriers is that the straps need to be adjusted to the size of the wearer. For some, the baby carrier will be too small, while for others it’s impossible to get tight enough. A wrap however, always fits and is comfortable for everyone (regardless of your size). You can spread the fabric wide over your shoulders and back (depending on what you prefer) and there are no buckles, preformed straps or fasteners that may hurt. Babylonia wraps are very soft and made from 100 % organic cotton. The special wrap fabric is knitted or woven to give the perfect support. A pre-shaped baby carrier doesn’t adjust as well to the shape of your body with its contoured shoulder straps , buckles and fasteners. Shoulder straps may slip down, pressing into your neck or just be too loose and buckles or closures can cause pressure points. Are all baby wraps the same? Which baby wraps does Babylonia make? Babylonia produces seven very comfortable baby carriers. The Tricot-Slen Organic is a baby wrap made of 100% organic cotton that can be worn in various positions. The way of tying is the same for all positions, which makes the Tricot-Slen Organic easy and quick to put on. The Tricot-Slen Organic, with its natural stretch, guarantees a perfect fit and makes the wrap very comfortable and easy to use. The special knitting technique with limited stretch in length offers perfect support for all babies. The Tricot-Slen Organic does not have any buttons, buckles or other clasps which may hurt and is available in many colors to match any style. Both the user’s manual and demonstration DVD clearly explain how to use the baby wrap step-by-step. The Tricot-Slen Cool is a super lightweight baby wrap made from 100% Newlife, a unique and certified fiber made out of recycled plastic bottles. 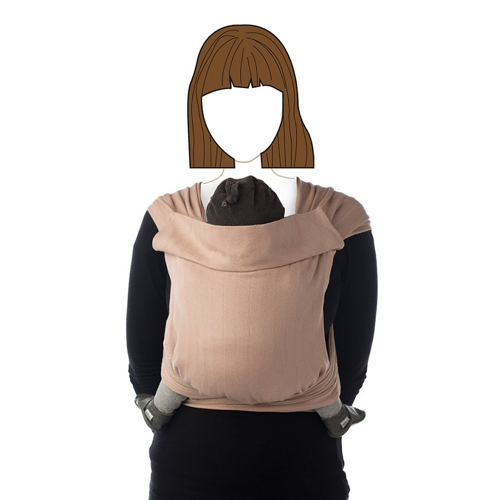 You can carry your baby in the same positions as the Tricot-Slen Organic. Putting on the Tricot-Slen Cool is the same for every position. Just like the Tricot-Slen Organic the special knitting technique offers optimal support and comfort. Even though the baby wrap weighs next to nothing, it gives excellent support. The fabric is moisture wicking and breathable, which means it is delightfully cool during summer, yet comfortable during winter. 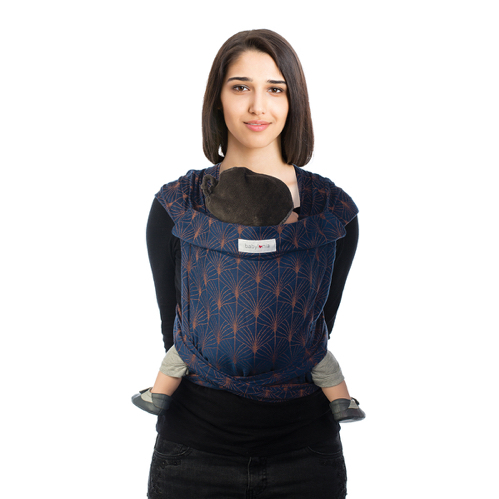 The baby carrier wraps itself perfectly around you and your baby, and is very user-friendly: it dries immediately and it does not need any ironing. 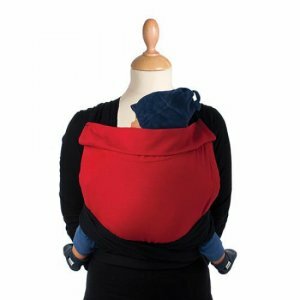 The Tri-Cotti consists of two fabric loops made of 100% organic cotton, which lets you carry your baby in different positions. It is ideal for both the cradle position and the upright position. 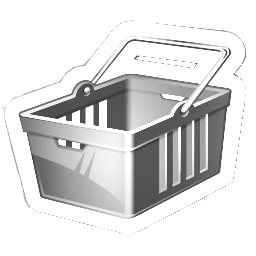 It’s very easy to use; no tying and no buckles or clasps. The Tri-Cotti is available in 3 sizes: Small - Medium - Large. The correct sling size is not determined by your size or the size of you baby. As your child grows, the fabric will stretch, and the Tri-Cotti will always fit. Simply use your own clothes size to determine the sling size required (S = size 34, 36, 38 M = size 40, 42 and L = size 44, 46 or S = size 2,4,6 M = 8, 10 and L = 12, 14). Note: after use, the material will stretch by about 5 centimeters (2 inches). The BB-SLEN is a very comfortable woven wrap which can be used from birth all the way up to children of 4 years old! With the BB-SLEN, all carrying positions are possible. The BB-SLEN is made of 100% organic cotton and produced in a Fair Trade project in India. The unique weaving technique ensures that the fabric feels soft and comfortable as well as offering excellent support. The BB-SLEN comes in 4 sizes: 260cm, 460cm, 490cm, 560cm. The 260cm is meant to be used like a BB-SLING, going over only one shoulder. The BB-SLEN in 460, 490 and 560 cm allows all positions. The size to buy depends on your clothing size; shorter people use the BB-SLEN 460 cm and taller people 490 cm. 560 cm starts at clothes size 46 (Women’s 14) or can be used to wrap an extra time around your waist for added support. 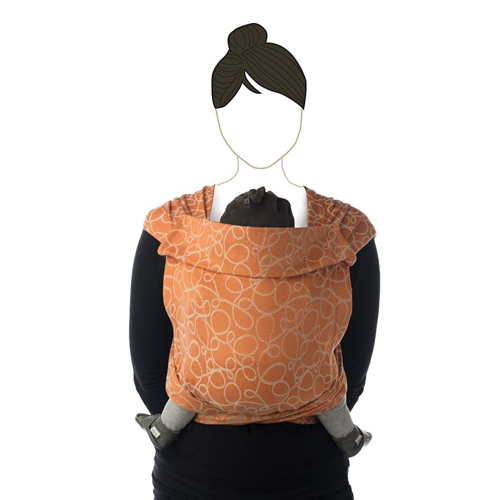 The BB-SLING is a ringsling type of baby carrier made in a Fair Trade project in India. The special sling is 100% organic cotton and woven using the best techniques for slings, offering optimal support for newborn babies as well as children up to 3-4 years. Two aluminum rings allow easy adjustment, which makes the BB-SLING comfortable and easy to use. Although you can use the BB-SLING for different carrying positions, it is most popular for the hip position. There is no other sling as easy and comfortable as the BB-SLING! The BB-TAI is inspired by traditional Asian Mei Tai carriers. It is simple to use, adjustable, and comfortable for both wearer and child. It can be used to carry the baby in front, on your hip, or on your back. The BB-TAI is appropriate for newborn babies up to toddlers and beyond and includes a removable pouch for small babies. It can be worn by adults of all sizes, as well as children and adolescents who would like to carry baby. The BB-TAI has an integrated head support to stabilize baby's head when sleeping and is compact, lightweight and can be worn in all seasons. 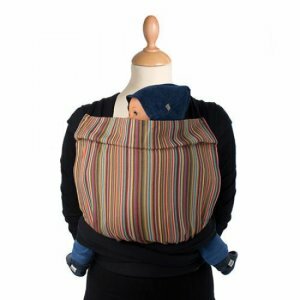 The BB-Tai is made of 100% organic cotton, with non-toxic dyes, comes with a special zipped bag for storage, and is specially woven to wrap around the curves of baby and wearer. Suitable for kangaroo care (skin-to-skin carrying) and breastfeeding. The BB-SKIN to SKIN is a kangaroo baby wrap specifically designed to use during your postnatal period and for kangarooing prematurely born babies and babies nursed in an incubator. It’s perfect for those first hours and days when skin-to-skin contact is so very important! With the BB-SKIN to SKIN your baby can relax safely against you while you can rest and even fall asleep. This baby wrap cannot be purchased by private individuals but can be obtained if you ask your midwife or gynecologist. The BB-SLEN is available in 4 sizes. How do I know which size fits me? DThe BB-SLEN comes in 4 sizes: 260cm, 460cm, 490cm and 560cm. The size you choose depends on your clothing size and the positions you want to use. 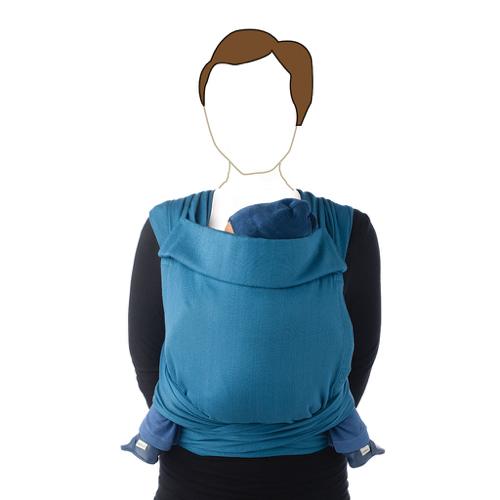 The 260cm is a short wrap, meant for usage like a BB-SLING, being worn over only one shoulder. The BB-SLEN in 460, 490 and 560 cm allows all positions. The size depends on your clothing size; shorter people use the BB-SLEN 460 cm and taller people the 490 cm. 560 cm starts at clothes size 46 (Women’s 14) or can be used to wrap an extra time around your waist for added support. A disadvantage of having extra fabric around your waist means it’s harder to hide the extra fabric underneath the waistband as you might do with a knitted wrap. Regarding the size of the baby wrap, can both mom and dad use the same wrap? The Tricot-Slen, BB-TAI and BB-SLING fit all sizes – for shorter people as well as for tall people, both men and women. The Tri-Cotti is available in 3 clothes sizes (S, M, and L), so if mom and dad have a different clothing size, they cannot use the same Tri-Cotti. The length of the BB-SLEN depends on the size as well. Smaller people will use the 460cm BB-SLEN whereas taller or heavier people need the 490 cm or even 560 cm BB-SLEN (starting at clothes size 46 Women’s 14). The BB SLEN also exists in 260 cm but this length has another way of carrying and another user manual. The 260 cm is designed to be used similar to a ringsling and is worn over only one shoulder. The BB-SLING is available in 2 styles: padded and unpadded. Which model should I choose? Babylonia’s ringsling is available with either a padded or unpadded shoulder. Except for the shoulder, both slings are identical. Choosing between padded or unpadded depends on your personal preference. In general, most people prefer the padded version as it is soft on your shoulder and the fabric is already spread wide open, so you don't need to spread the material across your shoulder and back yourself. However, there are also people who prefer the unpadded version because it allows you to choose how far to spread open the fabric, particularly people with narrow shoulders who might be more comfortable with the fabric spread less over the shoulder. What’s the difference between Babylonia’s baby wraps and other brands? Although wraps are available in different colors and patterns, there is a clear difference in the quality of different brands. For example, the type of fabric or thread, the knitting or weaving technique, the country of production and the use of organic cotton all determine the quality of the sling. All Babylonia wraps are high quality and available in many different colors. Each wrap comes with very clear instruction manuals with pictures and tips. For Tricot-Slen there is even an instructional DVD. The Tricot-Slen Organic and the Tri-Cotti are both made from 100% GOTS-certified organic cotton. The Tricot-Slen Cool is made from Newlife, a fabric made out of recycled plastic bottles. All knitted baby wraps are produced in the Netherlands and the unique knitting technique offers perfect support. Babylonia’s woven baby wraps are made of special wrap fabric from 100% organic cotton and are produced by Fair Trade organizations in India. The two knitted wraps are produced in the Netherlands and Germany, made of 100% GOTS certified organic cotton, and use a unique knitting technique to ensure optimum support. The Babylonia woven wraps are made of special wrap fabric in 100% organic cotton and are produced in fair trade projects in India. Which Babylonia wrap will be most comfortable for both baby and me? 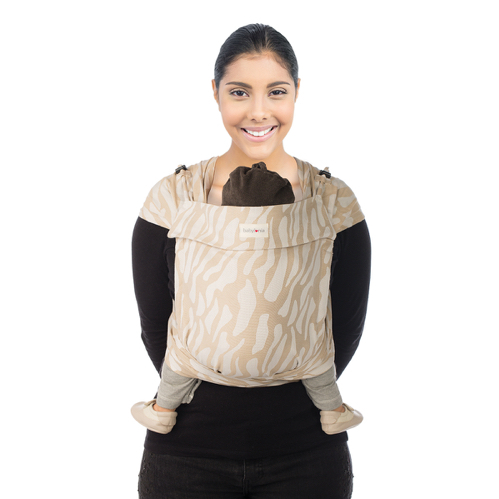 All Babylonia slings are very comfortable and ergonomic for both carrier and child. Depending on what you and your child prefer and in what position you want to carry (on front, hip or back) different baby wraps are recommended. Which Babylonia baby wrap is easiest to use? If you have a small baby and are not that experienced with babywearing, you might want to start with a Tricot-Slen or Tri-Cotti. Both the Tri-Cotti and Tricot-Slen are slightly elastic in width so you can tie on the wrap first and then put your baby in the sling using both hands. The Tri-Cotti is composed of two loops which you place over your shoulders. You can choose different positions depending on the size and age of your baby. The Tricot-Slen is very easy to use as well and can be used immediately after birth. Once you have learned how to tie the wrap, you can experiment with the different positions to carry your baby. 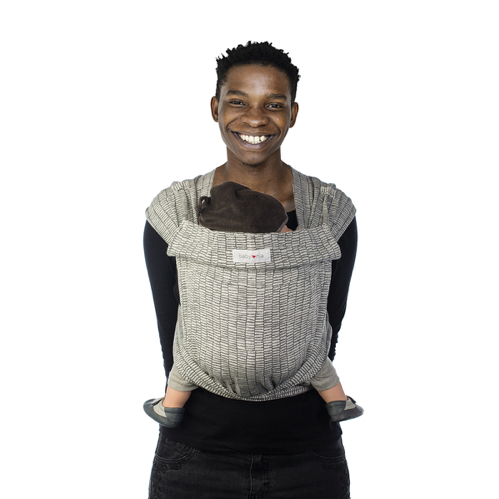 BB-SLING - simply place the ringsling over one shoulder, place your baby in it and pull on the fabric to make it snug around your baby. Carrying your baby on your hip allows you to use your hipbone for extra support. On your hip, your baby is able to see everything but can also fall asleep easily or lay his head against your chest and close his eyes if there is too much stimulation. 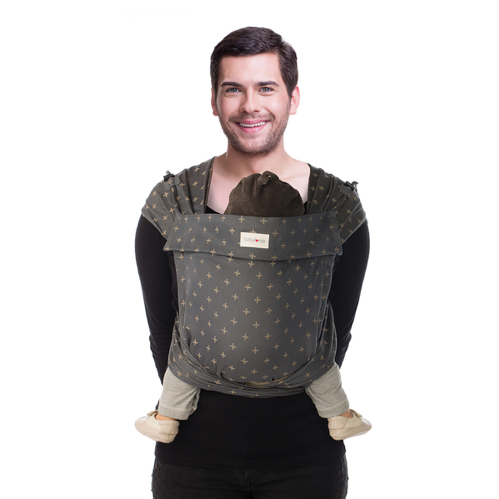 With the BB-TAI you can carry your baby easily on both your front and back. Carrying on your hip is also possible but we recommend the BB-SLING for hip carrying as this is easier and faster. 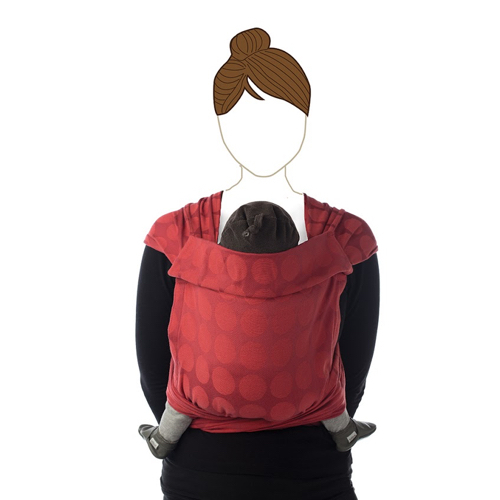 Using the BB-SLEN might take a little more practice because you tie the wrap while holding your baby. However, once you've practiced a few times, it comes naturally. All Babylonia wraps are supplied with clear and detailed instructions. Which baby wrap is most suitable for carrying newborn babies? All Babylonia baby wraps are suitable for use from birth. do you have experience in babywearing? do you also want to carry an older brother or sister or just the newborn baby? how long do you want to carry your child? are you planning to buy another baby wrap or do you want a wrap that will work for all ages? is your partner going to use the same baby wrap? Are you a different size than your partner? are you going to use it in the summer or winter? In general we recommend starting with a Tricot-Slen. It is a good beginner wrap because the Tricot-Slen is soft and it will always fit (both your and your partner). You tie on the wrap first and then place your baby in it so you have both hands free to pick up your child. If you discover that both you and your baby love babywearing, you will probably want to try more styles of wraps. Are baby carriers expensive? Isn’t it just a piece of fabric? 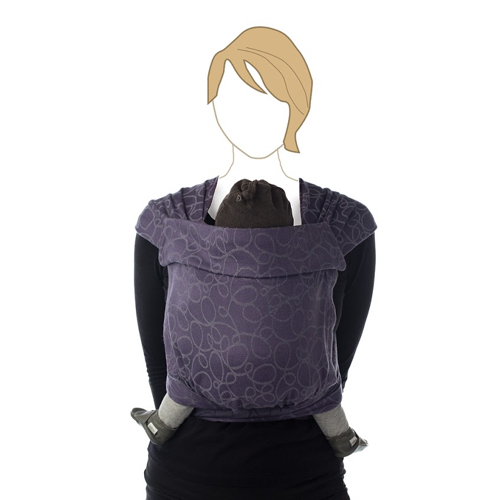 In order to carry your baby safely and comfortably, the fabric should offer proper support. 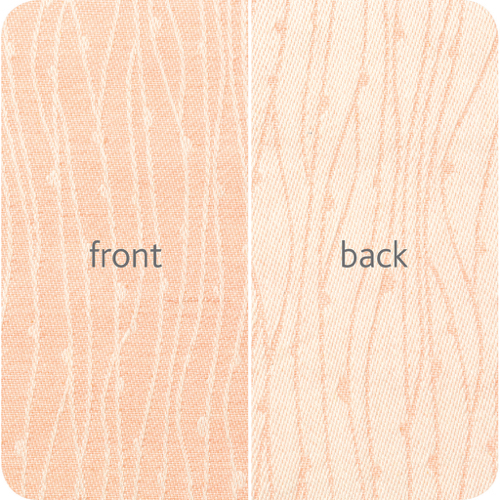 Baby wrap fabric is knitted or woven in a special way in order to always give the best support. In our opinion, if you think a knitted Tricot-Slen or a woven BB-SLEN is too expensive, you can use a standard piece of fabric. But in normal woven fabrics you will notice the absence of the special diagonal stretch as the fabric uncomfortably "rubs" baby's legs and your shoulders. It will also be difficult to tie the fabric beautifully and pull it tight properly. Therefore it provides less support and makes your baby feel heavier. If you buy a piece of jersey knit fabric you should be even more careful. Ensure that the fabric does not stretch too much. The special knitting technique of the Tricot-Slen has been continuously optimized over the years and is very different from loose-knit fabric that is commercially available.